We need to have a talk . . . While you give me, man's best friend, a bath quite often, you have yet to bath the family cat even once. I can hear your excuse already. It's that old wives' tale about never bathing a cat. It's all hogwash. 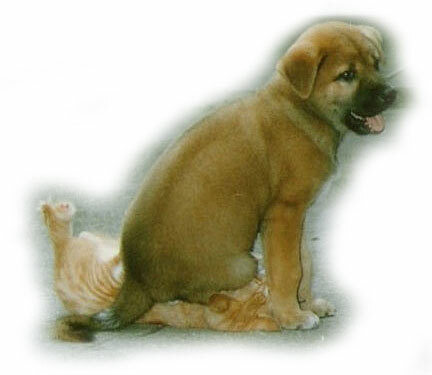 Cats need to be bathed as often as dogs . . . more often actually since they are constantly licking themselves. Their hair must be covered in dried spit! In case you are unsure how best to go about bathing the family feline, below you will find my detailed instructions for washing the cat . . .
Add the required amount of shampoo to the toilet water. Lift both the lid and the toilet seat. CAUTION : Do not get any part of your body too close to the edge, as his paws will be reaching out for any purchase they can find. The cat will self-agitate and make ample suds. Never mind the noises that come from your toilet, the cat is actually enjoying this. I am sure you will find this method very helpful. Please let me know when you plan to bath the cat. I want to watch.